The modern kitchen has become the heart of today’s home. We have done a range of kitchen remodels from removing walls to transform confined kitchens into spaces perfect for entertaining to simple cabinet upgrades in condos. 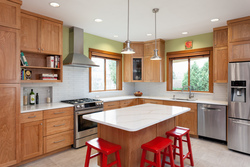 We work with a variety of materials to match a kitchen project with your budget, from high end custom cabinetry and custom stone countertops to budget friendly Ikea cabinets and laminate countertops.